Property 5: Gite With Private Pool And Panoramic Views, perfect getaway! 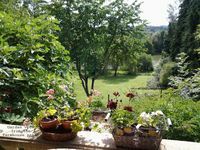 Property 9: Beautiful 3 bedroom house in the Dordogne with private pool and gardens. Property 12: 200 year old renovated country farmhouse. CHALET ALONG LAKE, GREEN PERIGORD, pool, quiet and perfect rest. Property 13: CHALET ALONG LAKE, GREEN PERIGORD, pool, quiet and perfect rest. Property 17: Peace and privacy in a beautiful farmhouse with private pool and large garden. Property 27: Cottage in Perigord in a former meta-mill near Brantome. Property 36: Modern, calm & great views!!! Property 40: Stay in a medieval castle with a pool and a restaurant. Property 42: Tranquility, privacy, comfort, beautiful views and a private pool! Property 43: Holliday home in a beautiful Chateau with Pool and restaurant. Property 47: Cottage located on a hill surrounded by a garden with pool. Property 48: Holidayhome with covered terrace, private pool and panoramic views. Property 49: Farm and separate guest house with beautiful views of the valley.